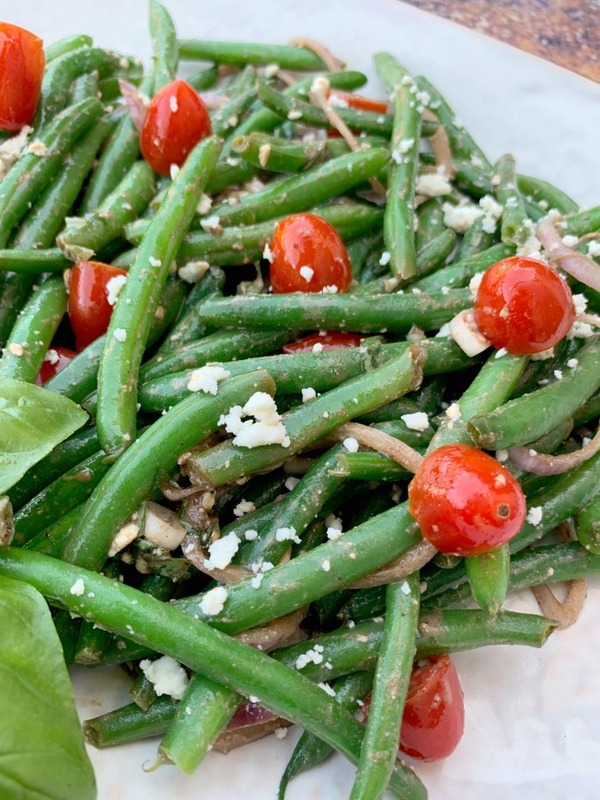 Easy, Cold and Fresh Balsamic Green Bean Salad is the best, healthy quick summer salad recipe with fresh string beans, tomato, feta cheese, and homemade Italian dressing. This vegan recipe is raw and marinated to perfection. Feel free to top with bacon and almonds if you want a little crunch! 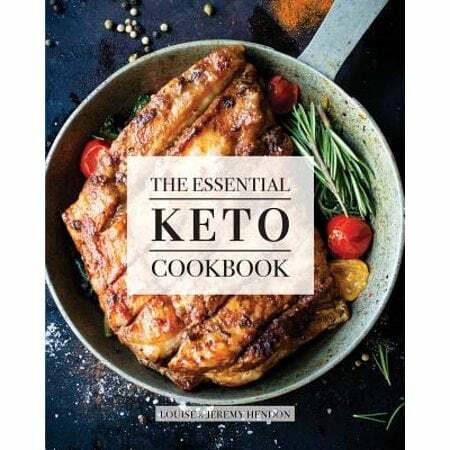 This low-carb dish is also perfect for the keto diet. 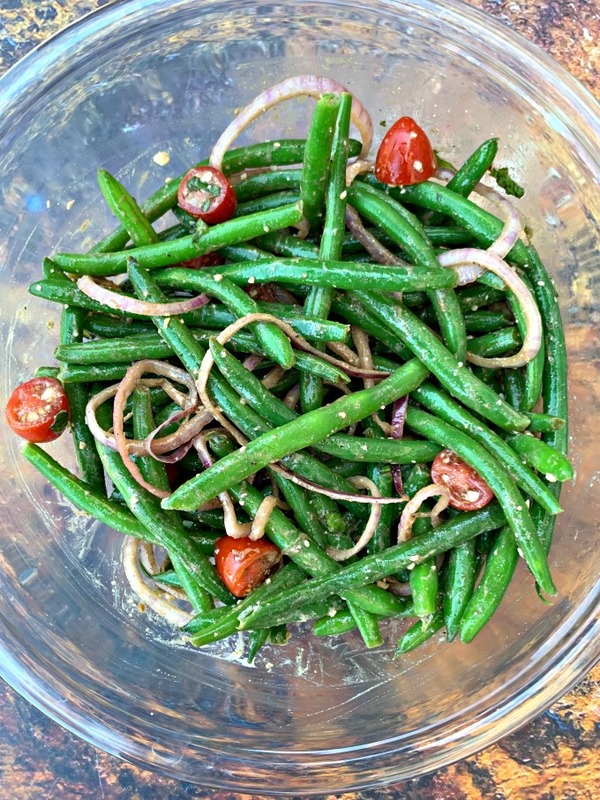 What Kind of Green Beans Do You Use to Make Green Bean Salad? Can You Use Canned Green Beans? I use fresh string beans with the ends trimmed. You can use canned green beans, but I wouldn’t recommend them for a salad. 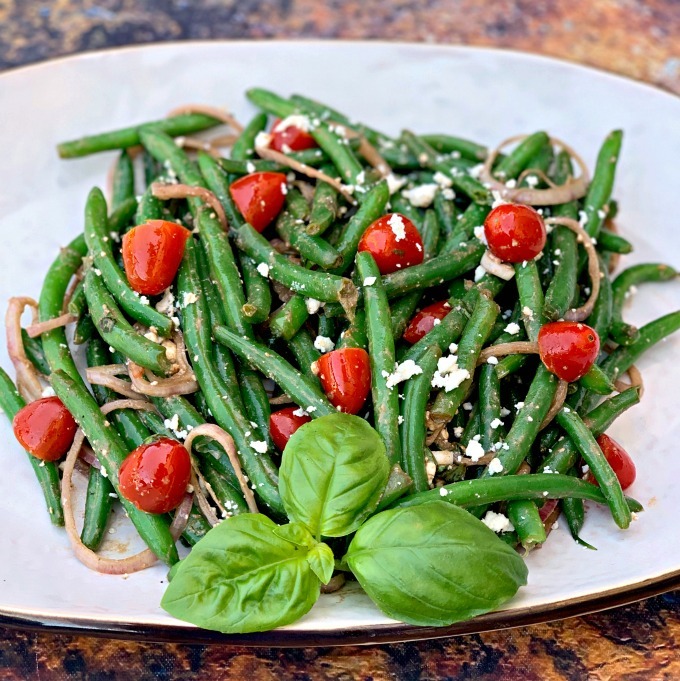 Fresh, blanched green beans will make the perfect salad for this recipe. Blanch the green beans on the stove. You can read more about How to Blanch Green Beans here. You will need to first blanch the green beans because you don’t want them to be mushy. When you blanch green beans you submerge the green beans in a pot of boiling water for only a few minutes. The green beans should turn bright green. Upon removing them from the boiled water, place the green beans in a bowl of cold water to stop them from cooking. This will help produce a nice, crisp salad. 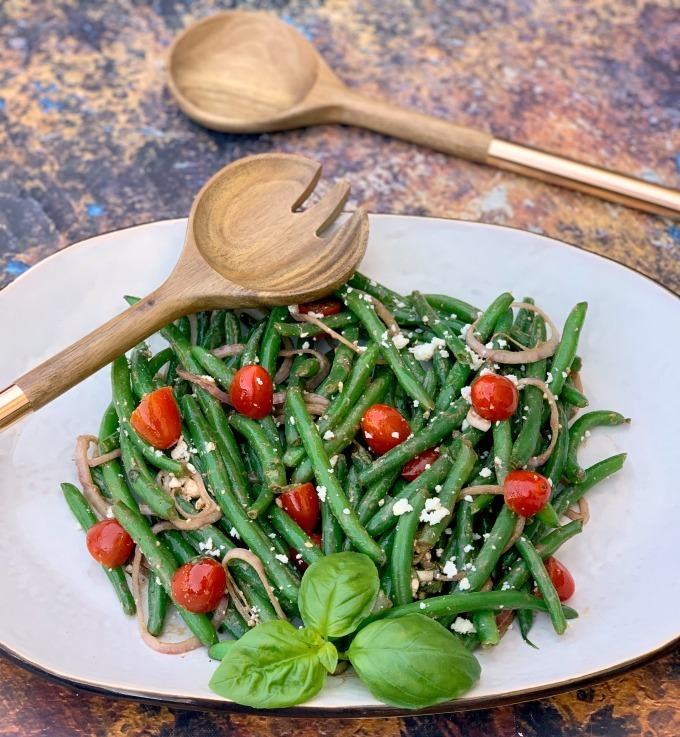 Add the green beans to a large bowl with olive oil, balsamic vinegar, sliced red onions, basil, salt, pepper, and crumbled feta cheese. Yes, you can use frozen green beans and follow similar steps to prepare them. The beans will not have as much crunch as fresh. 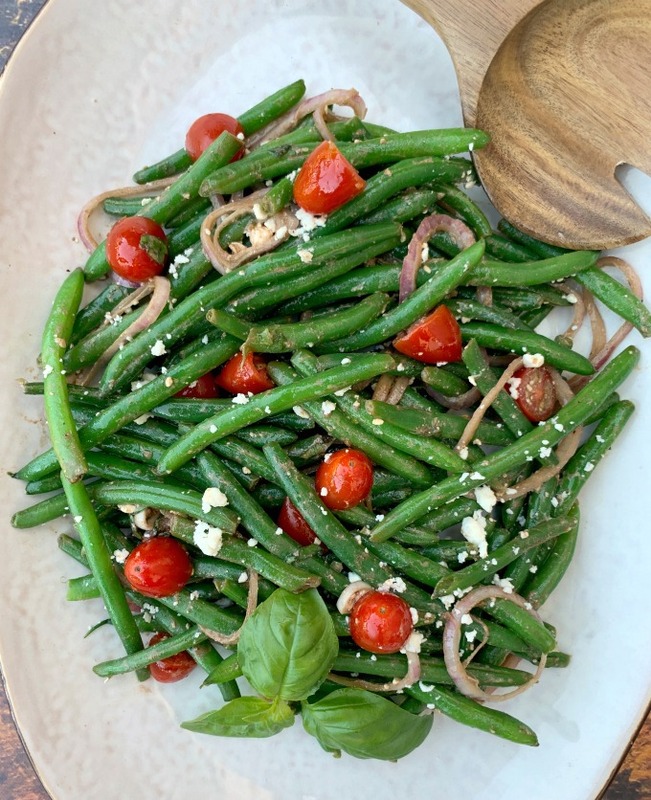 This green bean salad doesn’t use any sugar. The hint of sweetness throughout comes from the balsamic vinegar and cherry tomatoes. How Long Will Green Bean Salad Last in the Refrigerator? Green bean salad will last in the fridge for 3-4 days. Can You Freeze Green Bean Salad? If you plan to freeze it, I wouldn’t add the balsamic vinegar to the entire salad. 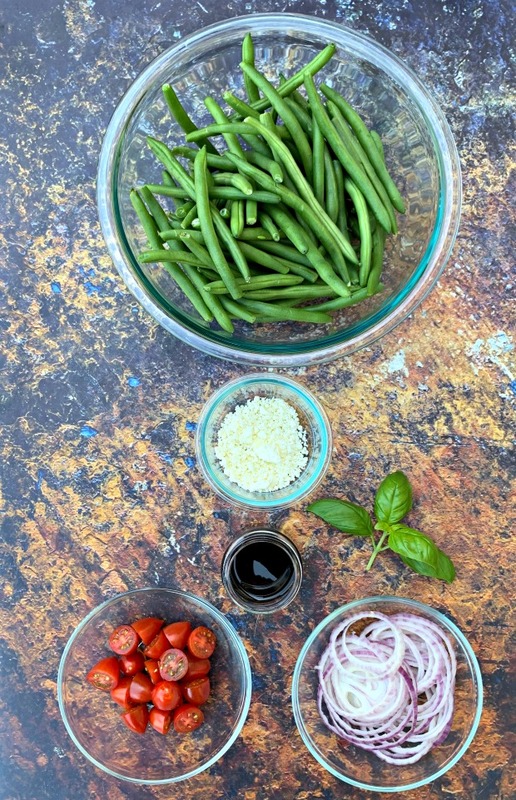 Freeze it without the balsamic vinegar. Add about 6 cups of water to a large pot on the stove. Boil the water. 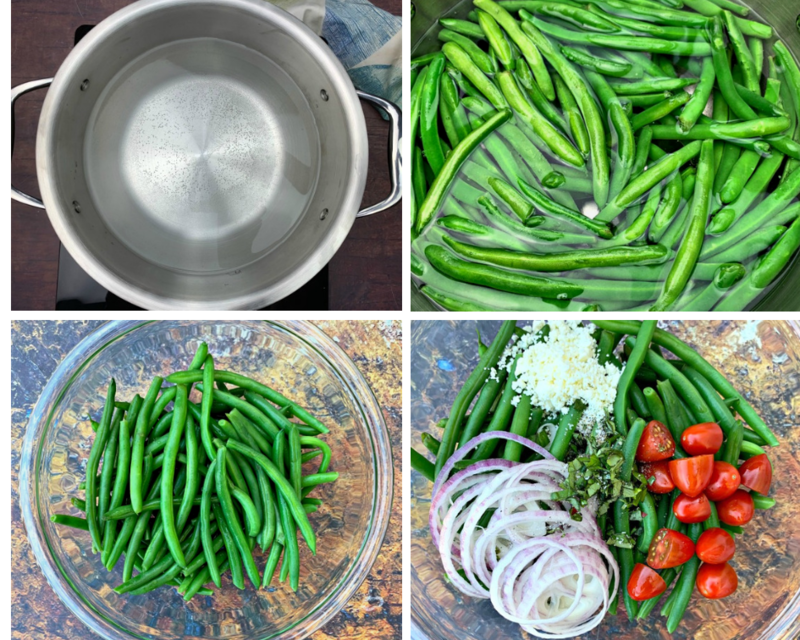 When the water has boiled, add the green beans. Cook for 2-3 minutes until the green beans turn very bright green and are crisp. Remove the green beans from the pot and rinse with cold water. Dry the green beans. 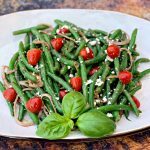 Add the green beans to a large bowl with the balsamic vinegar, olive oil, feta, tomatoes, basil, sliced onions, salt and pepper to taste. Chill in the fridge for 45 minutes.